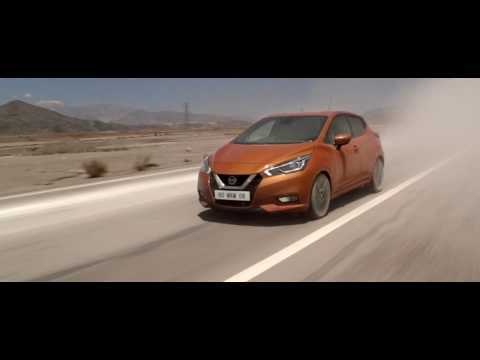 Experience the Nissan Micra like never before. Nissan hasn’t just given the Micra attitude, but personality. The Micra’s new style is inspired from sports cars, but created to suit your everyday needs. Nissan have sculpted the Micra with sleek lines, creating the bold, unique look and fashioned more modern touches to enhance its sporty characteristics. Bright LED headlights, stylish front grille, and modern rectangular front fog lights create the alluring face. Hidden rear door handles, floating roof and rear spoiler create the fluid movement inspired by sports cars. Inside the Micra, you will not find a shortage of fine craftsmanship or technology. High quality soft touch materials are used through the dashboard, and with your ability to choose your own personal coloured trim, your Micra will be fashioned just the way you like it. The ergonomic anti-fatigue seats, D-shaped steering wheel with control buttons, and smart central console are ingeniously designed to enhance your driving experience. The Nissan Micra features 6 speakers with 2 embedded in the driver’s headrest from Bose audio, creating the ultimate listening atmosphere. The Micra’s technology experience continues with the Advanced Driver Assist Display, offering turn-by-turn directions, the NissanConnect Display using Apple CarPlay, intelligent Around View Monitor, giving you a bird’s eye view of your car, and Intelligent Mobility. Nothing says ‘my car’ like getting to personalise your Micra to your preference and style. By adding an Exterior Pack option, choose from 4 available colour options for your door mirrors, side mouldings, front and rear bumper finishers, and much more. Make the interior suit you with the choice of exclusive colour tones for your seats, dashboard and panels, and take your driving experience to the next level. The Nissan Micra’s performance is better than ever with its rigid body structure and low driving position, offering a thrilling driving experience. With Nissan’s Active Trace Control, intelligent braking assists in keeping you in control, and Active Ride Control uses brakes on each wheel and adjusts engine torque to smooth any bumpy rides. The Nissan Micra is available in three engine types: 1.0 petrol 73PS, IG-T 90 turbo petrol engine, and DCI 90. Available trims for the Nissan Micra include the Visia, Visia +, Acenta, N-Connecta, and Tekna. Test drive the Nissan Micra today at Park’s Nissan.